Got to love the upcharge for fatty sizes lol. How much for a 3XL Jersey and a sticker ? I wouldn't mind getting some stuff. 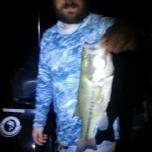 Hello to all I'm from East Tennessee I fish Boone and watauga lake along rivers, streams and ponds.